In recent days, the Saugatuck Island bridge project has been given the final touches. Traffic is once again busy to and from this neighborhood on Westport’s westerly shores. 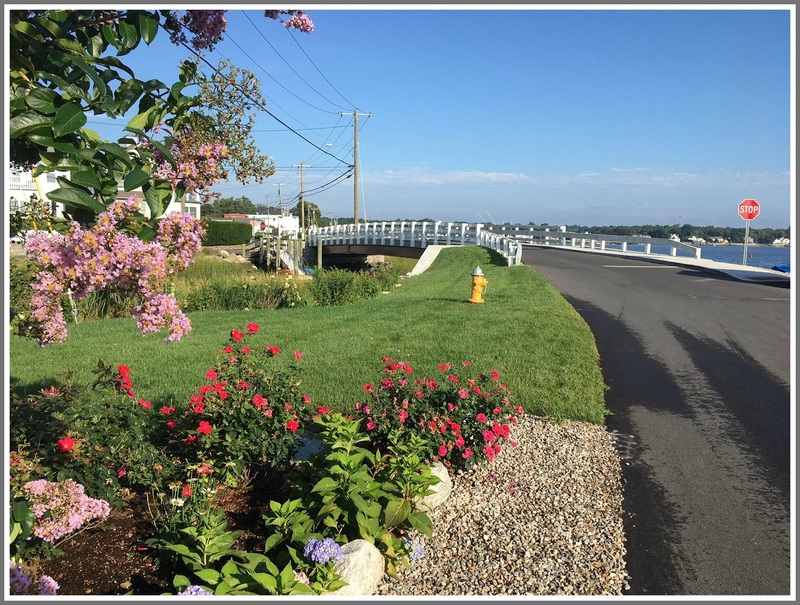 The Saugatuck Island Special Taxing District arranged for whitewashing of the bridge railings, and has restored landscaping that had been disrupted by heavy construction equipment. 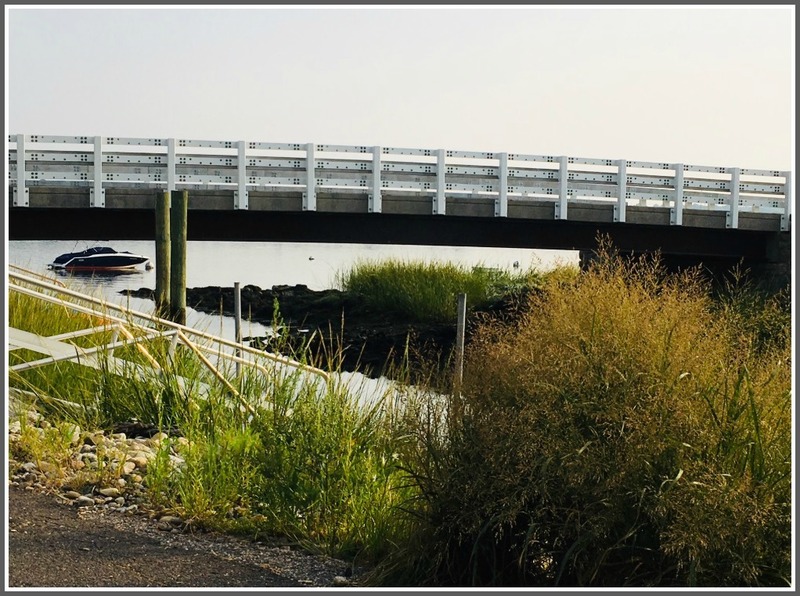 The new bridge replaces a quaint timber structure of wooden pilings and rustic railings originally built in the 1920s. The old bridge was well past its intended lifespan in 2012, when it suffered structural damage in Superstorm Sandy. The total cost of $2.1 million includes a $1.3 million FEMA grant. The town and SISTD split the remainder 50-50. Construction began last year. The new bridge retains the feel of its predecessor, while providing greater safety, practicality and rock-solid durability. The single span of concrete deck sits on steel girders, with an asphalt surface. It is secured on 50-foot deep sheet pile abutments clad in concrete. 96 feet long and 20 feet wide, the bridge can hold 20 tons – more than sufficient to accommodate heavy emergency equipment, unlike its wooden predecessor. The bridge’s anticipated life span is 75 years. The bridge completion comes as Saugatuck Island has been experiencing a housing boom. During the past 5 years, about 1/3 of the approximately 100 properties on the island have changed hands. Prices range from $700,000 to $9.8 million. Others have been expanded, elevated or otherwise enhanced. New construction has increased the number of larger, higher-end luxury residences. In addition to 400 Westport residents, the island is home to Cedar Point Yacht Club, established in 1887, and the Saugatuck Shores Club (1946). SISTD was established in 1984 to tax island property owners for local community costs — mainly road maintenance. The Saugatuck Island bridge, as seen from Canal Road. As for Saugatuck Island itself: Near the end of the 19th century, the Army Corps of Engineers cut a canal between what is now Canal Road and Spriteview Avenue, to provide a faster, safer route for onion farmers to transport their goods to Norwalk. This entry was posted in Places, Real estate and tagged Cedar Point Yacht Club, Saugatuck Island, William Adler. Bookmark the permalink. Thanks – no one seemed to know. I’ll add her credit in! 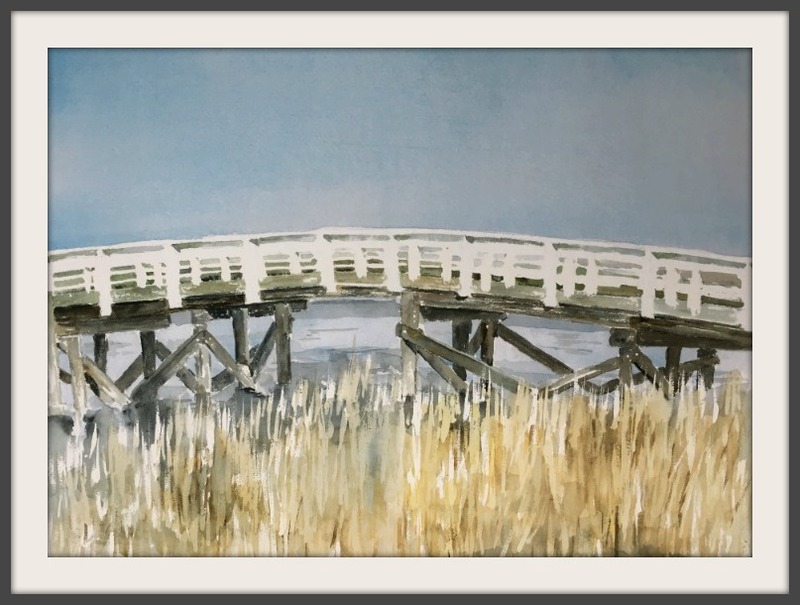 Been over that “old” bridge a million times, especially back in the 70’s, when my father lived in two different locations on the island, one of which was near canal street (or off of canal street … don’t recall). It was a bit “rickety”, even back then, IMHO. New one looks charming and safer all at once. One thing: is it any higher in elevation overall, or same height? Just saying … I love infrastructure fixes, but longer term insight/planning is absolutely necessary as well. Laughing, because before we know it, all the houses along the shorelines will be tittering on stilts higher than the Empire State Building! (just snarking here … a little). Sharon, the bridge is at street level on either side but arches gently in the middle so it is a little higher. Global warming is a macro worry but this bridge is designed to be solid for many years to come! The bridge is actually lower over the water than the old bridge, so, depending on the tidal flow, boats and kayaks and stand-up paddleboards have a much shorter window in which to get in and out of the harbor. For boats, you’ve got maybe 3 hours when the water isn’t either too high under the bridge or to low to the canal floor. Dikes and windmills would be a nice touch. May a little dredging, for safety sake.